First, of all, congrats to the winner of my Cooking Memory Giveaway: Connie Saunders! 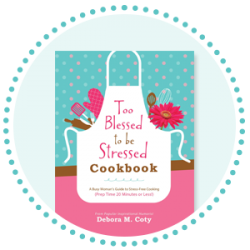 Connie will receive an autographed copy of my award-winning Too Blessed to be Stressed Cookbook, PLUS a $25 Walmart gift card to buy ingredients to make some of the 100+ stress-free recipes that only take 20 minutes or less hands-on prep. 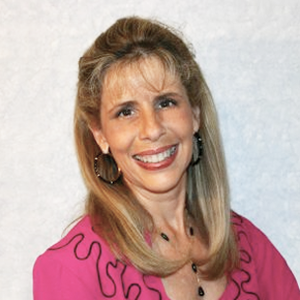 Congrats, Connie! And for those of you who didn’t win this time, hang around – another giveaway is right around the corner! Many, many thanks to my BBFFs (Blessed Blog Friends Forever) who entered the giveaway by sending me your favorite kitchen memories. I giggled over some and was moved to tears by others (more than once, let me tell you). Thank you so much for sharing your wonderful, life-shaping memories. I wish I could print them all here, but alas, space allows me to include only a handful. I’ll start with some today and finish with more in my next post. I know you’ll enjoy them as much as I did! My favorite cooking memory is with my grandmother. She was a farmwife who made biscuits and cornbread every day. I loved watching her roll out the biscuits. She used a regular biscuit cutter but she gave me a lid off of an Alka Seltzer bottle to cut bite sized biscuits for myself. I have always treasured this memory! ~Connie S.
With eight grandchildren and one great-granddaughter, I have a slew of memories cooking up a storm with my grands. One of my favorites would be when I renamed all the ingredient in a recipe by using corresponding scriptures. It was fun, got my granddaughters into Papa God’s Word, and turned out some yummies for the tummies. Another favorite memory is our annual tradition of “Day of Giving,” the first Saturday in December. My granddaughter and I make homemade soup and cornbread and deliver them to shut-ins. It reminds us that December is not all about receiving, but that it truly is “More blessed to give than to receive.” ~Patti F.
The last memory I have of my mother before she and Dad divorced (I went to live with Dad afterward) was of me sitting on the counter while she made lemon meringue pie. The part that was so fascinating was this tiny little vanilla flavoring ball that would float and melt as she stirred. It was magical watching it disappear in that yummy goodness! In my memory, it was a place that I visited often after our home life fell apart. ~Liz G.
Mom and I had a day off together and were deciding whether to go shopping or what when my great aunt called and casually asked, “Whatcha doin’?” Mom explained and she said, “Oh, skip that and come over and sit a spell with me.” We decided to do that instead and luckily changed clothes before we went. We stopped and got her one of her “what the doctor doesn’t know won’t kill him” vanilla shakes (she was 85 with diabetes). Upon arrival at her house, we found literally a pickup truck load of snap beans awaiting us. Realizing we’d been conned, we had to laugh. She had a full pot of iced tea ready, and we sat on the porch snapping and sorting beans. Then when those were done, a SECOND truckload of corn arrived! Whew – shucking corn after snaps was some work. Then we spent hours canning all of them. Another surprise came when her daughter arrived with a potluck dinner, thinking she had to help with the canning. Nope, all done! So we had an impromptu family dinner and everybody had a laugh about how we got conned. ~Nicole H.
My grandma loved to bake snickerdoodle cookies, chocolate chip oatmeal cookies, pie and fudge – always our favorites. I loved when I arrived and she said, “Connie, I baked lemon meringue pie just for you!” I always felt so special that she made it more often than my sibling’s requests. I was over 40 when I learned the real reason why I was favored. It was because it was HER favorite pie too! ~Connie J.
I still have (and use) the recipe book I received at my bridal shower in 1982. It’s the type that holds handwritten recipe cards in cellophane sleeves. All the ladies attending my shower brought one or more recipe cards so that I could start my married life with some favorite recipes of my friends and relatives, and not have to experiment too much on my new hubby. There are splots and splashes on many of the cards now … but those are just added love and memories! ~Jeanne G.
Okay, friends, gotta stop here, but stay tuned … more great memories coming next post! Thank you for letting us all share in these memories of others! Blessings and happy Fourth of July! And a very happy Independence Day to you too, Connie!